Focus and scope. 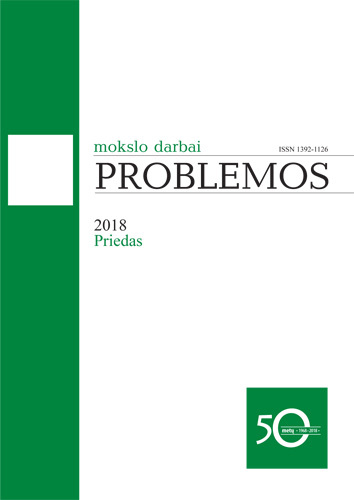 Problemos is a philosophical journal publishing original scholarly articles and research papers devoted to all kinds of problems in philosophy. The journal also publishes translations of the original texts, book reviews, and the chronicle of academic life. The submissions are subject to double-blind peer-review by two scholars. Indexed in. The Philosopher’s Index (2000), Arts & Humanities Citation Index (Web of Science) (2005), Current Contents / Arts & Humanities (Web of Science) (2005), CEEOL (2005), Central & Eastern European Academic Source (2007), Humanities International Complete (2007), Humanities International Index (2007), DOAJ (2019). History. In 2009-2015 publication was funded by the Research Council of Lithuania according to The National Lithuanian studies development programme for 2009-2015 (Agreement No. LIT-2-56).